In general, urban roads will have a 30mph speed limit although some more strategic urban roads will have 40 or 50mph speed limits. Some areas, particularly outside schools, will have 20mph speed limits. 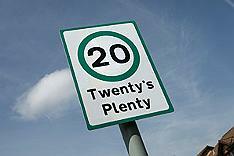 In most urban residential areas in West Lothian, the council has introduced advisory 'Twenty's Plenty' signposting to indicate that 20mph is the maximum speed that drivers should travel at in these areas. Rural roads will generally have a 60mph or 50mph speed limit. In April 2009, the council agreed a Speed Limit Strategy against which all future speed limits will be assessed. This was prepared part of a review of speed limits starting with A and B class roads. Full details of the review and the Speed Limit Strategy are available to download. Requests for new speed limits are dealt with by the Road Safety and Traffic Management Team within the Roads and Transportation Service based at Whitehill Service Centre, Bathgate. Requests should in the first instance be directed to the Customer Service Centre.